Tablut is a variant of the ancient Viking game Hnefatafl. It's interesting for a number of reasons. Hnefatafl is one of the oldest games for which we have a fairly reliable set of rules (along with Go and Mancala). It's unusual because the two sides have different objectives, and unequal forces. The Gold fleet is initially deployed in the center area. 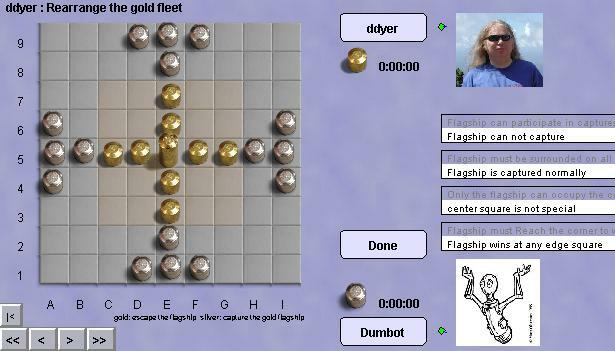 The objective of the gold fleet is to move the flagship to the edge of the board. The Silver fleet is initially deployed in the periphery. The objective of the silver fleet is to capture the gold flagship. All pieces move like chess rooks. Capturing is by sandwiching an opposing piece between two of your own pieces. Robots: the robot player is ok, but it's definitely possible to torture it by making extreme adjustments in the initial setup. Don't be unsporting. the forces will be evenly balanced. The back story: A modern variant of Tablut, Breakthru, was one of my earliest non-chess games. In fact, the silver and gold fleets I use in the game are the ships from Breakthru. Breakthru is in a difficult position to get permission for though, so I settled on the original, classic game for Boardspace.